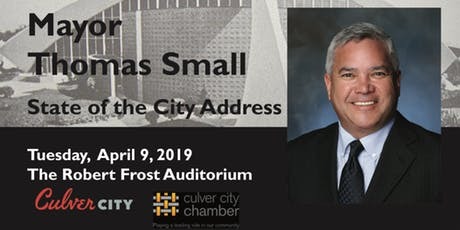 The City of Culver City, in cooperation with Culver City Chamber of Commerce and Culver City Unified School District, invites you to join Mayor Thomas Aujero Small as he presents the 2019 State of the City Address on Tuesday, April 9.The Mayor will share the City’s most recent accomplishments and present several key projects and programs that impact the community. There will be entertainment, and light refreshments will be available for purchase. The State of the City Address will be held at the Robert Frost Auditorium, located at 4401 Elenda Street, Culver City. Networking and mingling will begin at 4:30 p.m., with the program promptly starting at 5:30 p.m. The event is free and open to the public. Please consider walking, biking or carpooling to the event! Parking is available in the Culver City High School and Culver City Middle School parking lots. Consider taking a Culver CityBus to the Mayor’s State of the City event! Line 3 drops you off at Braddock Drive and Overland Avenue. Line 7 drops you off at Culver Boulevard and Elenda Avenue. Please contact the City Manager’s Office at 310-253-6000 or email the City Manager’s Office, if you have any questions.